park23 wrote: Did anyone else noticed that the link from video description to iTunes is for another band ? When you click on that link, you're directed to your own country's iTunes Store. 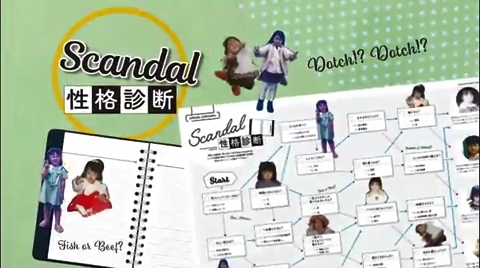 It currently only directs to the correct SCANDAL if you're in Japan. Since iTunes has not yet made the single available to purchase internationally, nor has the rest of their discography been made available for purchase on there once more, it's currently linking to another band for everyone outside of Japan (that 80s band as well as some street punk band from London). It'll probably be fixed once the single's officially out on the 27th. 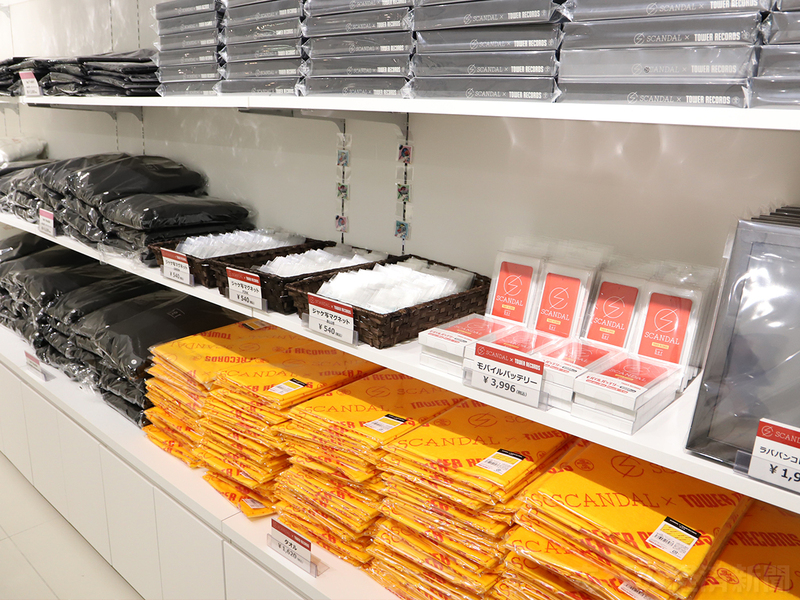 It would help a lot if they would have their own online store where they can sell at least CD quality FLACs/WAVs. Paying 14 euro + shipping, VAT and import for a CD with just 2 song is not really fair. Her is a label, but the Publisher is still Victor Entertainment and if Spotify is correct, the sound recording copyright is held by Victor Entertainment as well. If we take Kaela Kimura, who has a label ERA Music (i.e. just like HER), under Victor/Colourful Records, all her releases are still published by Victor. Registrant Name: JVCKENWOOD Victor Entertainment Corp. In theory you could get paid download versions AAC 128/320kbps or FLAC 96khz/24bit via Japanese service mora.jp, recochoku.jp but may need to jump some hoops to make a purchase etc. Oversea fans have been doing this. Or just wait for Apple iTunes release. The chance of HER doing its own download service right now is not likely, will take some time if it ever happens. I hope everything works well to get my order from CD Japan. I bought the t-shirt version (even though I didn't really like the t-shirt design), but I want to see how it goes so I can get the new album as soon as it drops. US Amazon has the CD for sale... But it's $17.05. Thank you ! I got it from recochoku.jp. Used tunel bear to pass location check and payed with my VISA card. I did not expected to accept it but it worked. Still a bit too much than I am used to pay for a song(2 euro) but I like the song. "Masterpiece" (the song) can actually be purchased on international iTunes stores! This at least works in the US, but it probably will work in other countries too. If you search "SCANDAL Masterpiece" or "SCANDAL (JP) Masterpiece" and click on the price of the song, it'll prompt you to log in to your iTunes account and then let you purchase it! Note: Don't click on the album title; it'll give you a prompt that says it's "not available" in your country. Weird, yes, but you are nevertheless able to purchase it if you click on the price. One of my friends and I tried it and it worked for us! I like the new style of packaging for the t-shirt edition. It looks unique. I can confirm that it works in France too, I bought it 2 days ago. The same "unavailable" message appear if you click on the album title, but if you click on the price it works perfectly. Have they mentioned when they are planning to release the Mabataki video? Yes I am eager to see and hear that too being a huge Tomomi fan. Don Dio wrote: Have they mentioned when they are planning to release the Mabataki video? Not yet. It'll probably be some time in the coming week, though, since the single's out then. Still not crazy about the song, but the video looks like it will be interesting. 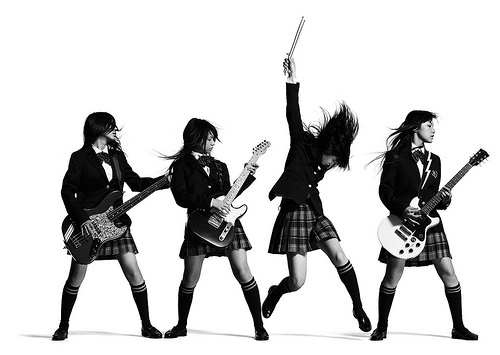 I can't decide who looks more gorgeous in this: Haruna or Tomomi. 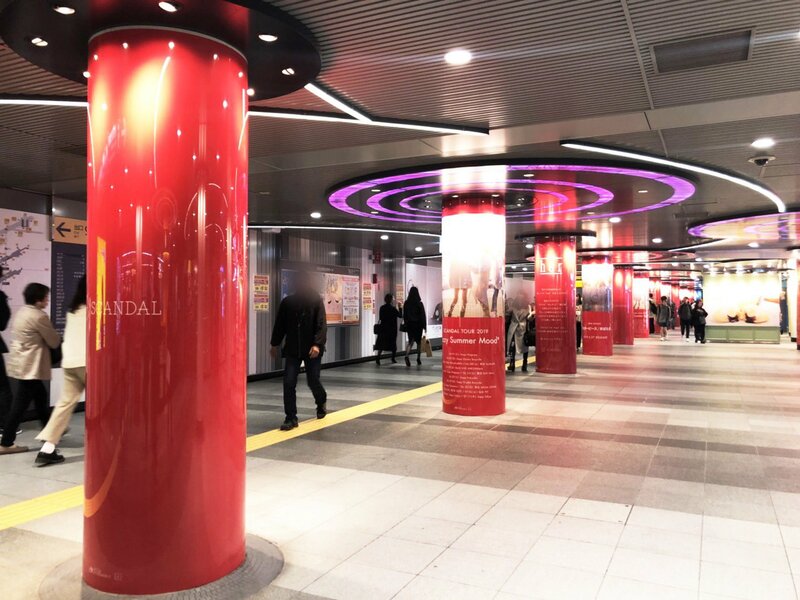 The Shibuya station marketing scheme is pretty cool. That must have cost a bit to pull off. The MV for Mabataki looks terrific. Yeah, I can't wait for the Mabataki MV, looks so good. 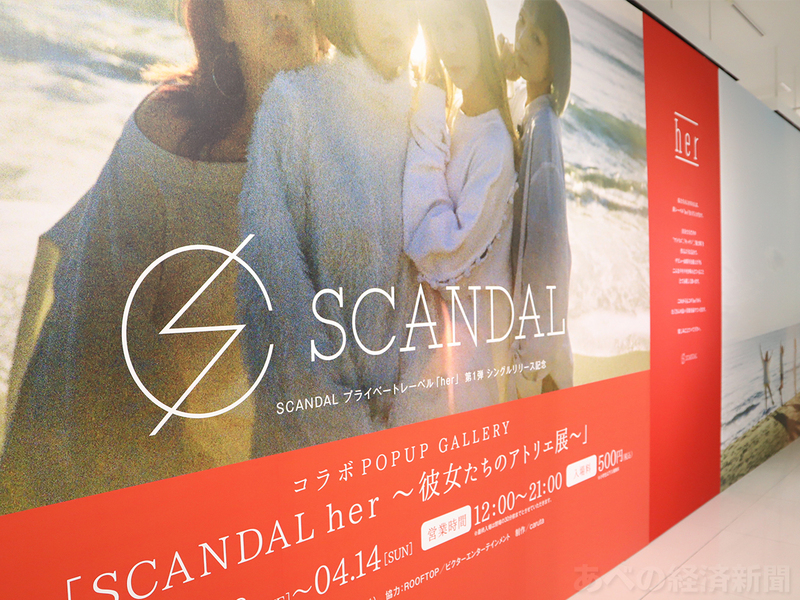 The collaboration POP UP GALLERY 「SCANDAL her ～Kanojo-tachi no Atelier Ten～ (A Girls' Atelier Exhibition)」 has begun from 3/26 at Tower Records Abeno Hoop's SpaceABENO. 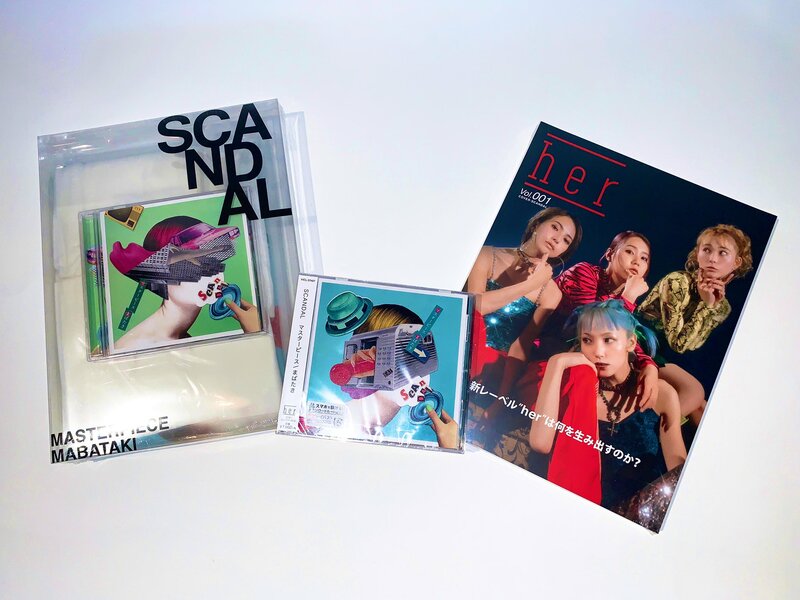 This is a collaboration project in commemoration of the first release from Osakan all-girl band SCANDAL's private record label 「her」. 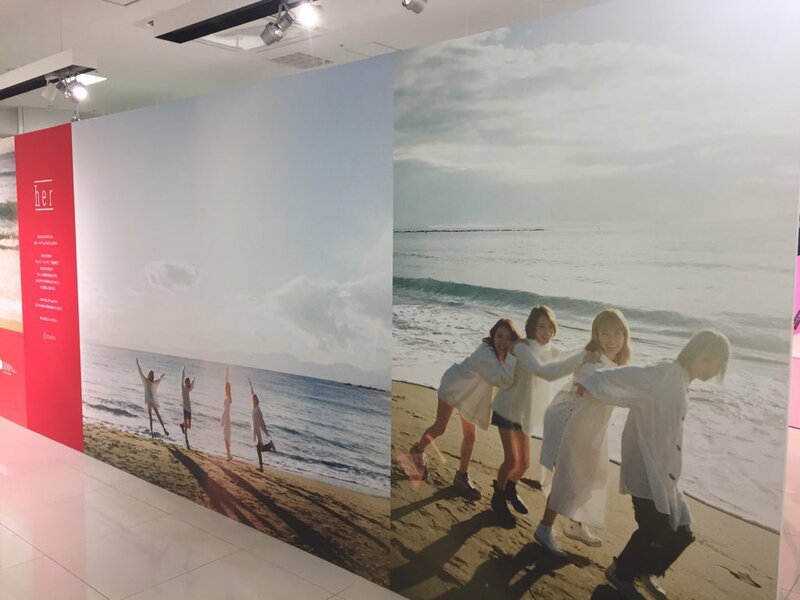 It features things such as an exhibiton of panel pictures that imagine the world views of the songs on their double A-side single 「Masterpiece / Mabataki」 out on 3/27, and a lyric video of the world of 「Masterpiece」 will be screened here only, along with the sale of collaboration merch. This is the first event at the newly created event space 「SpaceABENO」. We will continue to develop exhibition events, etc. in the future. Business hours are from 12:00～21:00. Admission is 500 yen (free for elementary school children and younger). Runs until 4/14. A Zexy (Japan’s largest wedding magazine) CM-like video that explains the her magazine that's included with Limited Edition A of our new single 『Masterpiece / Mabataki』 out on 03.27!! "Pursuing the establishment of a private record label - Fully loaded! Long interview"
"Private interview - What's been going on recently with the members & what they're obsessed with - Individual interviews"
"I want all of them!! Special Present"
You can set a reminder. 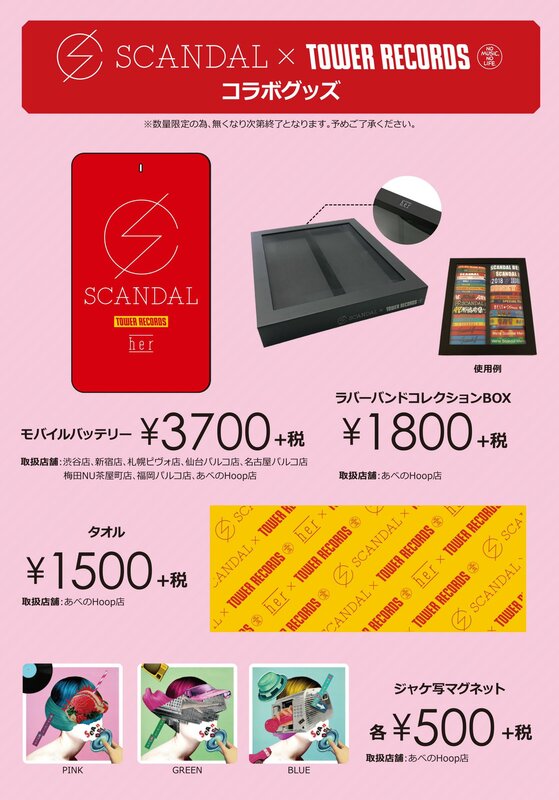 The rechargable HER USB batteries were available at Tower Records stores where the singles was released today. 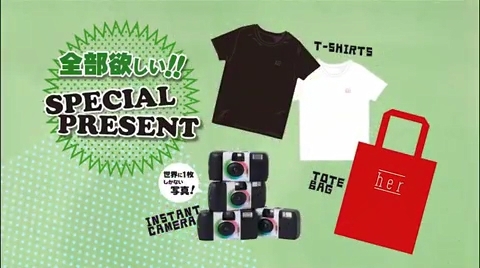 What's with the "Special Presents" at the end of the CM, does it come with the magazine or something? I saw some pictures of the magazine on instagram, looks so good. Kinda regret I've chosen the t-shirt edition lol. I think they intended to have the 80's feel to it. See the 6：4 picture ratio! Maybe it's only me the arrangement reminds me a bit of Hall & Oates.